My path took me to Nashville, Tennessee this weekend. 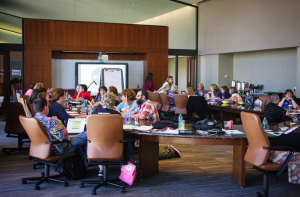 A group of teachers and tech coaches from all over the country sat around a huge round table upstairs in the Country Music Hall of Fame. We were gathered to learn about singer/songwriters, Common Core, and a program called Words to Music. 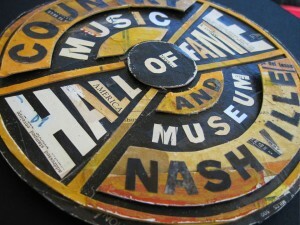 Words to Music is a program where students brainstorm and write poetry and song lyrics, send them to the Country Music Hall of Fame where a Nashville recording artist puts their lyrics to music. The musician then Skypes into the classroom, performs the song and answers questions. Since we song write in my classroom regularly, my takeaway was a bit different. The teachers were all Discovery Education Network Star teachers (except for the handful of us new to the DEN, including myself). When meeting and getting to know these teachers, it was clear that being a DEN Star wasn’t a title or a badge, rather a belonging to a group of like-minded teachers who care and support. This group of teachers are a support system for one another when taking risks with classroom experiences, or problem solving new ways of engaging learners in innovative learning strategies. I am so lucky to have been a part of this weekend. I want to personally thank Tim Childers (@tchilders) and Porter Palmer (@DENPrincess) for creating a weekend of learning and bonding called Discovery Education Network Gone Country (#DENGC). I have made great friends and think partners. I wrote about driftwood in an earlier post. I will not remember all of the apps and websites we shared with each other (thats what twitter is for), my driftwood is the closing activity on Saturday afternoon. The session was opened with teachers who had been in the DEN for a while and on the leadership council to talk about their experiences. There were tears and laughter. Teachers don’t cry tears of joy when they talk about their professional development. This was more. This was relationships. The teachers split into grade level / tech integration groups to plan for implementation of our new understanding and appreciation of song writing. I gravitated to a group of Arts an inspired librarian, and tech integration specialists. Within the first few minutes we had all shared how we use music to help our learners make conceptual connection. Kati Searcy (@KatiSearcy), a DEN guru and teacher of talented & gifted students from Georgia suggested that we explore GarageBand. See earlier post here. So I suggested we write our own song. It was awesome. We recorded a few layers of piano, drums and acoustic finger picking guitar (to stay in the country style), and set off writing lyrics. I would like to thank my friend Gena Price (@GenaPrice) for connecting me to such a wonderful group of people. Your passion and connectedness inspires me to be the best I can be. If you are reading this and are not a member of the Discovery Education Network, get connected! Tim Childers, a wonderful photographer, documented some of the experience. Enjoy! This entry was posted in Professional Development, Uncategorized by mmedvinsky. Bookmark the permalink. Mike, it was such a pleasure to have you with us this weekend! I can’t wait to connect more online and at future DEN events! Mike, a nice reflection on your weekend. I am glad you had such a positive experience. Great group to be part of.